Tallycoin is a Bitcoin fundraising platform and a Patreon alternative. Welcome to the Bitcoin alternative of Patreon and GoFundMe! Tallycoin is the Patreon alternative. Accept Bitcoin and Lightning payments for your content. Tallyco.in is a fundraising platform, similar to GoFundMe or Kickstarter. 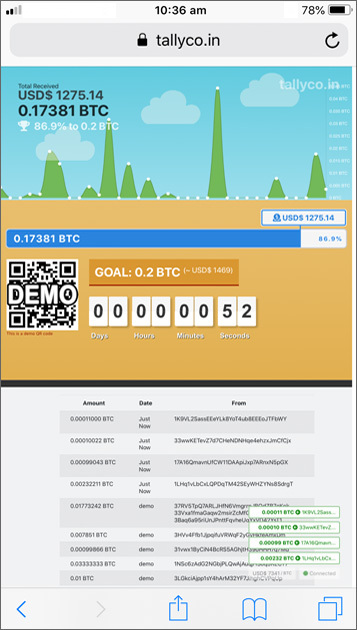 Receive donations directly to your own wallet, instantly. Lock content behind a paywall, similar to Patreon. Donors unlock their "perks" by contributing to your fundraisers. We take NO fees! When fans subscribe to your newsfeed, they unlock all your members-only content. Subscriptions are paid upfront for a fixed period of time. Tallyco.in takes NO fees! All donations go to your own bitcoin or lightning wallet that you control. We never touch your funds and every satoshi goes directly to you, immediately. Receive more donations by giving something back in the form of "perks". Perhaps it's an image, a written article or a personalized video for your donor. Perks are unlocked instantly upon payment. No minimums, no maximums! Offer 1 perk or none. Maybe 100 perks?! Lock perks for 10 cents or 10 bitcoin. This is your fundraiser. Your rules. Have a fundraising goal in mind. Set a time limit to create a sense of urgency. Offer donors some perks for donating. Tallycoin's mission is to facilitate the adoption of bitcoin as a mainstream global digital currency. We can do this by encouraging users who've never held bitcoin to begin earning this scarce asset by showcasing their skills and receive payment for their work. We encourage users who already hold bitcoin to support those that don't (yet). Together, we can onboard people of different talents and skills to join the new global economy. At Tallycoin, we believe Bitcoin has the greatest chance of any other social movement in giving *YOU* the financial freedom you deserve. Learn more about bitcoin here.